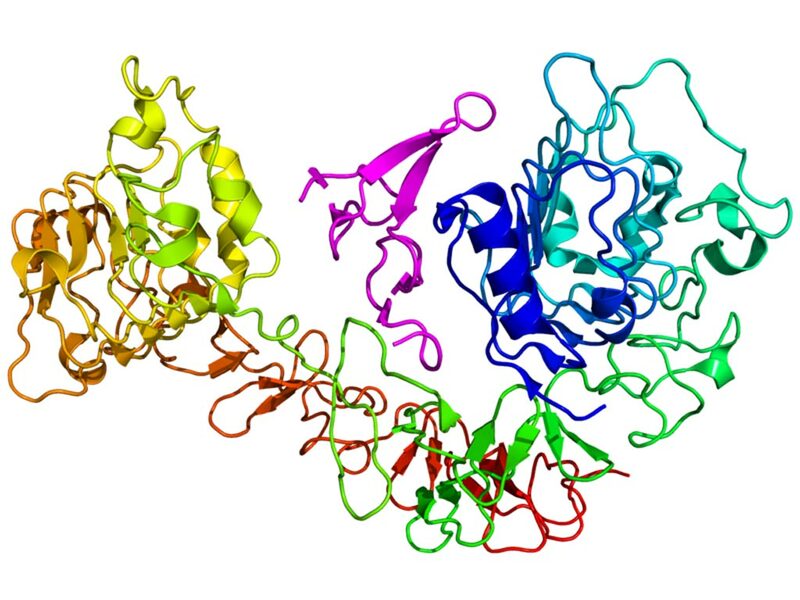 An often fatal autoimmune disorder was cured in mice by using a lentiviral vector to insert a working copy of the defective FOXP3 (Forkhead box P3, also known as scurfin) gene into blood stem cells. IPEX (Immune dysregulation, polyendocrinopathy, enteropathy, X-linked) syndrome is a severe autoimmune disease caused by mutations in FoxP3, a transcription factor required for the development and function of regulatory T-cells (Treg cells). Treg cells keep the body's immune system in check; without them, the immune system attacks the body's own tissues and organs. 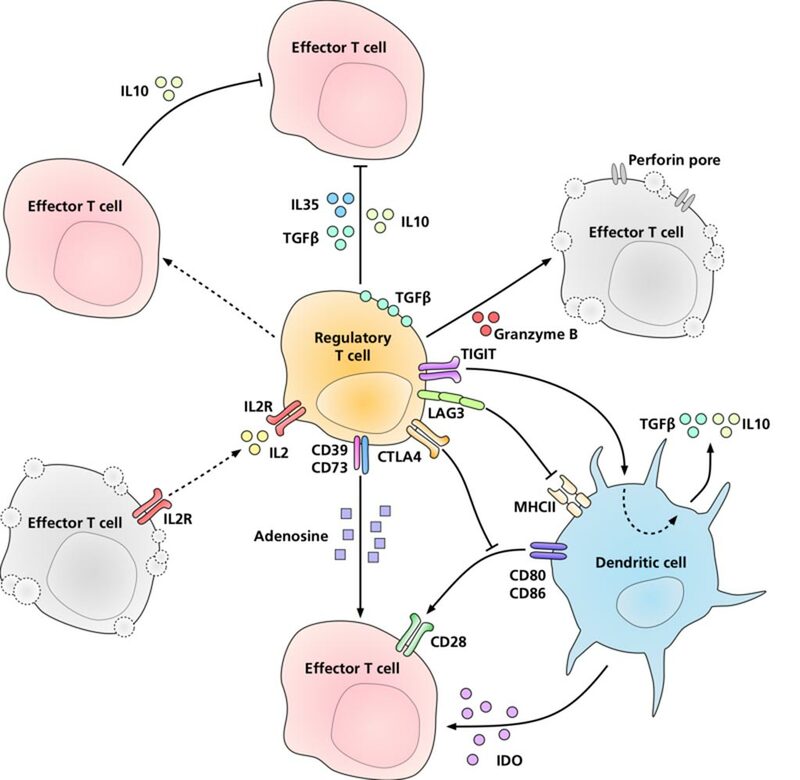 Image: A diagram of how regulatory T-cells suppress effector T-cells and dendritic cells (Photo courtesy of Wikimedia Commons). IPEX can affect the intestines, skin and hormone-producing glands such as the pancreas and thyroid, as well as other parts of the body. While the syndrome can be successfully treated with a bone marrow transplant, suitable donors are often unavailable, and the patient may be too ill to undergo the procedure. To replace the bone marrow transplant option, investigators at the University of California, Los Angeles (USA) developed a strategy for autologous hematopoietic stem cell transplant (HSCT) and gene therapy utilizing a lentiviral vector (LV) to restore FoxP3 expression under the control of endogenous human FOXP3 regulatory elements. The viral vector was engineered so that the gene was expressed only in regulatory T-cells, but not in other types of cells. The investigators published their results in the January 10, 2019, online edition of the journal Cell Stem Cell. They reported that both mouse transplant models and humanized mice engrafted with LV-modified hematopoietic stem cells showed high levels of LV expression selective for CD4+CD25+FoxP3+ Treg cells. LV transduction of the functional FoxP3 gene into HSCs restored development of functional FoxP3+ Treg cells that suppressed T-cell proliferation in vitro and reversed the IPEX autoimmune phenotype in vivo. Senior author Dr. Donald Kohn, professor of pediatrics, microbiology, immunology, and molecular genetics at the University of California, Los Angeles, said, "To treat humans with IPEX, blood stem cells would be removed from the bone marrow of patients with IPEX. Then, the FoxP3 mutation would be corrected in a lab using the IPEX-targeting vector. The patients would receive a transplant of their own corrected blood stem cells, which would produce a continuous life-long supply of regulatory T- cells." "It is exciting to see how our gene therapy techniques can be used for multiple immune conditions," said Dr. Kohn. "This is the first time we have tested a technique that targets an autoimmune disorder, and the findings could help us better understand or lead to novel treatments for other autoimmune conditions such as multiple sclerosis or lupus."